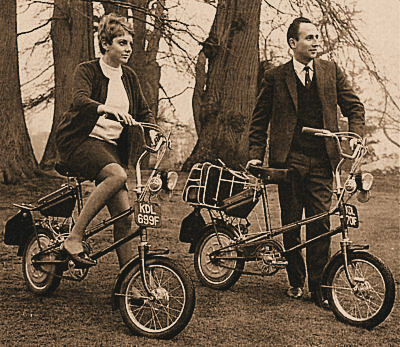 Clark Scamp Moped - The Clark Scamp was a moped manufactured by Alec Clark's company, AN Clark (Engineers) Limited and marketed in the UK from March to November 1968, with 3000 to 4000 units being ultimately sold. The Scamp was a slight diversion for Alec Clark from his core business of the manufacture of portable air-operated telescopic masts. The diversion, however, was short lived as a breach of confidence suit halted production in November 1968. The Scamp's design combined a proprietary bicycle frame supplied to AN Clark (Engineers) Limited by the CWS (Co-operative Wholesale Society) of Birmingham, who normally sold the bicycle as a "Commuter", and an in-house manufactured innovative 50 cc two-stroke motor transmitting its power to the rear wheel via an automatic clutch/gear-case using a friction drive to the tyre. Unfortunately for AN Clark (Engineers) Limited, the innovation in the Scamp's motor was said to be not all of their own design by one Mr Coco. By the time the Scamp appeared on the market in March 1968, it was claimed that the power unit was closely related to Mr Coco's own design. Mr Coco had earlier been in discussion with AN Clark (Engineers) Limited in regard to selling his motor design to them, an offer not taken up by Clark. Subsequently Mr Coco sued AN Clark (Engineers) Limited for breach of confidence. As a result AN Clark (Engineers) Limited paid Mr Coco 5 shillings per motor, with a trial subsequently never taking place. 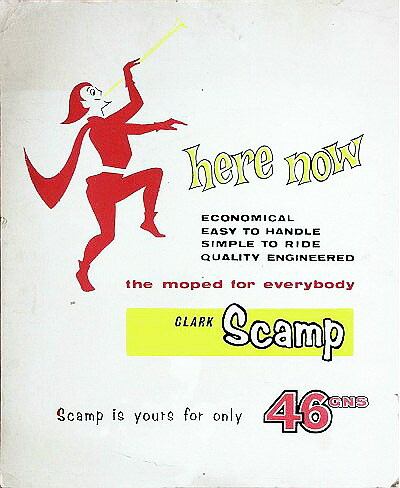 However the Scamp was discontinued in November 1968 and AN Clark (Engineers) Limited went into administration, with all of Alec Clark's mast manufacturing interests being taken over by a new company, Clark Masts Limited. Scamp Technical Details - The Scamp was a small wheeled bicycle with a gear-case in the rear wheel similar to that of the BSA Winged Wheel. The engine being mounted onto the side of the gear-case with the cylinder angled up towards the front at 45 degrees and placed generally out into the air stream for reasonable cooling. 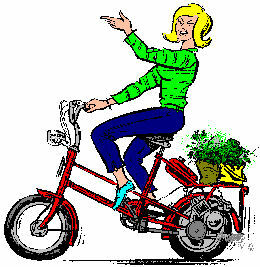 The Scamp's design used quite an unusual means of spinning the engine for starting purposes. The final drive was by a large gear, driven by a pinion, which ran in an oil bath. On the pinion shaft was a centrifugal clutch drum which had a slot machined into it. On the centrifugal clutch, which was mounted directly onto the crankshaft, there was a plastic counterbalanced pawl that was lightly spring loaded to bring it into contact with the clutch drum. As the machine was wheeled forward, the clutch drum rotated and the plastic pawl engaged the slot which in turn caused the engine to turn over. Once the engine was running the centrifugal clutch rotated causing the pawl to overtake the slot and, because it was counterbalanced, it pivoted out of contact with the drum, leaving the engine idling but not driving the rear wheel. As the engine was revved the centrifugal clutch transmitted drive to the rear wheel and, with the help of a couple of pushes on the pedals, the Scamp would get mobile. 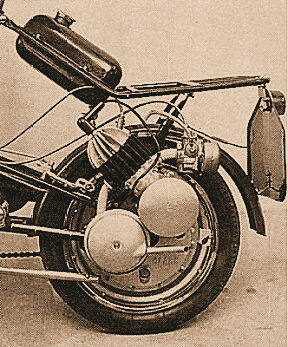 Mounted on the left hand side of the rear wheel, the 50 cc piston-ported 2-stroke engine featured radial finning on its alloy head and cast iron cylinder. The crankshaft was unusually constructed in that the flywheels bolted together by socket cap screws through the big-end bearing core with the con-rod seeming to run on uncaged roller bearings, so the whole assembly appeared to be home serviceable with no more than a simple Allen key! A Dansi flywheel magneto set was located on the nearside journal, while the drive was output to a simple single-stage centrifugal clutch. The rear 'disc' wheel was a primitive assembly comprising of a Dunlop 12"×2" rim bolted and riveted through the spoke holes, to a pressed steel disc form, fixed to a driving flange. It may be of little surprise to find that such wheels often displayed some buckle effects. The flange rotated on bearings around the rear axle, driven on a shaft from a large reduction gear running in an oil-bath alloy case, and powered by a pinion shaft from the clutch drum. Turning a "power key" located in the clutch housing enabled the drive to turn the motor, by a counterbalanced nylon pawl engaged through a slot in the clutch drum. Once the motor was started, centrifugal force overcame a spring to disengage the pawl. The automatic clutch engaged as motor revs were further increased. Turning back the "power key" disabled the pawl as the clutch rotated into contact, returning the Scamp to peddle bicycle mode. On starting, and once the motor got warm, the Clark Scamp cruised happily up to 25mph, above which, vibrations would start coming in through the Radaelli seat and the ride became uncomfortable. Downhill, 34mph maximum speed was occasionally achievable. Speed fell away readily as the bike encountered any incline, but it usually still managed to labour slowly up moderate hills at low revs without the need to pedal. Both brakes proved suitably retarding when required, with the rear calliper function proving surprisingly effective, though generally small wheeled machines would typically be expected to deliver better hub braking performance in any case, due to the basic law of physics. The Scamp proved to be an unhappy diversion for Alec Clark and his company, however following discontinuation of the Scamp, the company's portable air-operated telescopic mast business continued to thrive. Today Teksam NV and Clark Masts Teksam offer over 200 different models of Air-operated portable masts and emergency lighting systems. 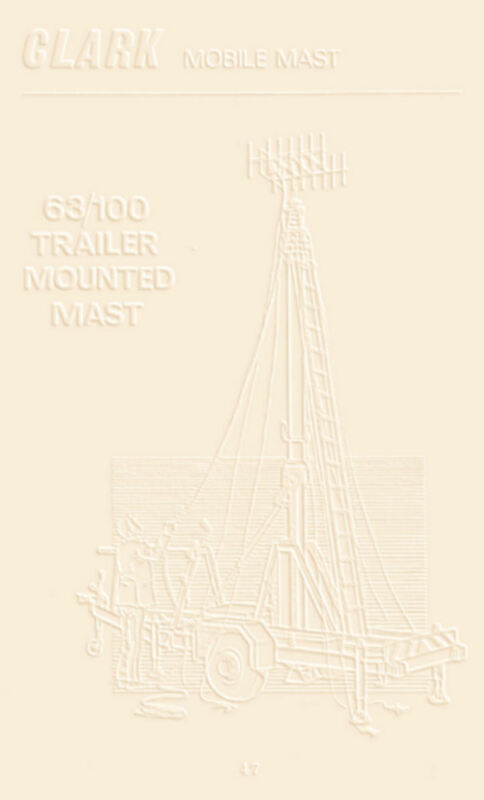 The manufacturer of Clark Masts today, Teksam NV, is represented in Australia and the Asia-Pacific region by Portable Masts Australia Pty Ltd.